You will enjoy a 2 hour guided tour that explores the Rocket Park at NASA's Johnson Space Center. This is where NASA trains the astronauts and operates the US human space exploration programs. You will see the Smokey Joe, Mercury Redstone rockets, and the H-1, F-1 and J-2 rocket engines on the outside, plus an up close walk around the massive Saturn V moon rocket inside the main building. The Saturn V is the full length of a football field and is very impressive. Your expert guide will describe each of the exciting Apollo moon missions, tell you tantalizing insider stories, and explain everything you see in terms everybody can easily understand. 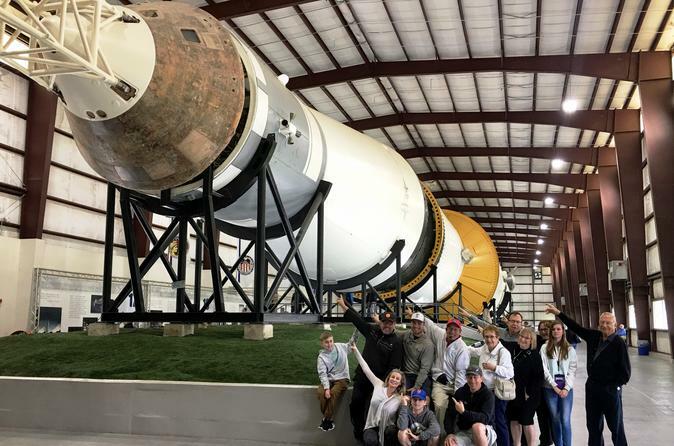 This tour is ideal for visitors with limited time who want a really interesting, fun and affordable experience at the NASA's Johnson Space Center near Houston. Meet your guide in the parking lot of the Rocket Park at NASA's Johnson Space Center. The specific street address is. 1601 NASA Road 1, Houston, TX 77058. The security guard will stop you as you drive into the NASA facilities. Please tell the guard that you have arranged a guided tour of the Rocket Park and he/she will wave you into the parking lot. Visit the Little Joe and Mercury Redstone rockets. Visit the H-1, F-1 and J-2 rocket engines. Visit an actual Saturn V rocket that launched the Apollo astronauts to the moon. It's the full length of a football field… very impressive!! Photo stop of the Space Shuttle. Your guide worked on this engineering marvel for 17 years. The tour ends at the Rocket Park parking lot. Your guide may change the order of this itinerary based on weather conditions, crowds and your particular areas of interest.